Simulations of one-dimensional boron ribbons and chains have revealed they possess several unique properties. 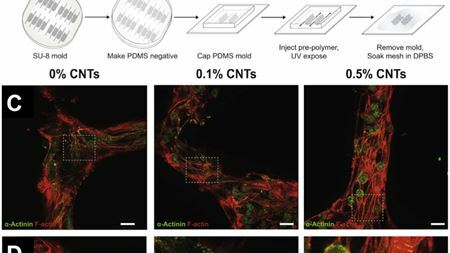 Polymer combined with carbon nanotubes matches the flexibility and conductivity of cardiac tissue. Terahertz scanner based on a carbon nanotube film is flexible, portable, and wearable. Scientists have used a new approach to investigate the formation of defects in materials at the atomic scale and in near-real time. Researchers have developed a technique in which nanoscale perovskite particles self-assemble to produce more efficient, stable and durable LEDs. Submissions for the 8th annual Reaxys PhD Prize are now open. Researchers have been able to create a high-pressure form of germanium, known as ST12, in a large enough sample size to confirm its characteristics. Conductive ink made from silver nanowires can print inexpensive, customizable circuit patterns on just about any surface. Firing highly-charged xenon ions at graphene has revealed that the electrons in this material are highly mobile, generating a very high current density. Scientists have used tiny diamonds known as use diamondoids to assemble atoms into the thinnest possible electrical wires, just three atoms wide. Christopher Hutchinson and Tadashi Furuhara join the Acta Journals. Through changes in its atomic vibration energy, graphene can distinguish a single hyperactive cancerous cell from a normal cell. Enjoy free access to the anniversary special issue of Current Opinion in Solid State & Materials Science. Sodium-embedded carbon nanowalls make highly effective electrodes in electronic devices such as solar cells and supercapacitors. Scientists have developed a novel solid-state battery by placing ultra-thin aluminum oxide between lithium electrodes and a solid garnet electrolyte. By optimizing the antireflection properties, scientists have fabricated a flexible transparent conductor from an ultrathin metal film. Graphene forms the basis for a new imaging platform that can map the electrical fields generated by networks of heart and nerve cells.